Get the latest news and first hand Information About Engineering Technology. 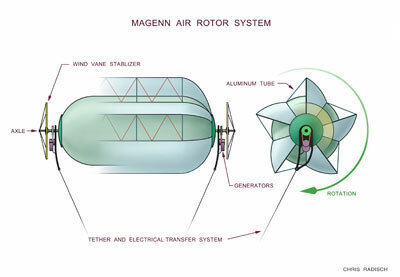 Magenn Power Air Rotor System (M.A.R.S. ), helium filled wind generator that rotates around a horizontal axis and sends electricity down a tether that can be used immediately, stored in a battery or routed to the power grid. The Magenn Power Air Rotor System (MARS) is a patented high altitude lighter-than-air tethered device that rotates about a horizontal axis in response to wind, efficiently generating clean renewable electrical energy at a lower cost than all competing systems. Airborne wind - turbines that fly in the sky and harvest energy from atmospheric wind has the potential, say proponents, of reducing the cost of wind power. 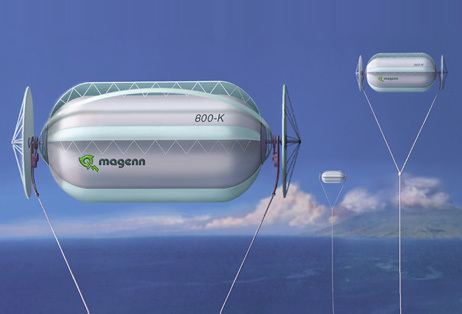 In April of 2008, Magenn Power made history by having the world's first rotating airship. This paper presents an analysis of M.A.R.S and its developments. The physical behavior of machine is presented through its components. This system is a highly advanced one that is been not yet implemented till 2010.Now Canadian company is taking orders to distribute in 2011 in all the leading markets. This paper also presents a detail view of working and advantages. .The wind is a completely renewable source that will last forever. The life cycle for the energy gained from wind turbines is simply as long as the physical parts last. The generation of electricity from wind power takes place in several steps. It requires a rotor, usually consisting of 2-3 blades, mounted atop a tower; wiring; and "balance of power" components such as converters, inverters and batteries Wind turbines at ground level produce at a rate of 20-25%, but when placed at altitudes from 600-1000 feet, energy output can double. The Magenn Air Rotor System or MARS is a stationary blimp kept afloat with helium and tethered into place on an electrical grid. Centrifugal blades on the MARS can generate up to several megawatts of clean, renewable energy at a price well below our current grounded wind turbines. An airborne wind turbine is a design concept for a wind turbine that is supported in the air without a tower. Airborne wind turbines may operate in low or high altitudes; they are part of a wider class of Airborne Wind Energy systems (AWE) addressed by high altitude wind power. When the generator is on the ground, then the tethered aircraft need not carry the generator mass or have a conductive tether. When the generator is aloft, then a conductive tether would be used to transmit energy to the ground or used aloft or beamed to receivers using microwave or laser. Airborne turbine systems would have the advantage of tapping an almost constant wind, without requirements for slip rings or yaw mechanism, and without the expense of tower construction. As of 2010, no commercial airborne wind turbines are in regular operation. A tether is a cord or fixture that anchors something movable to a reference point which may be fixed or moving. Energy generated by a high-altitude system may be used aloft or sent to the ground surface by conducting cables, mechanical force through a tether, rotation of endless line loop, movement of changed chemicals, flow of high pressure gases, flow of low-pressure gases, or laser or microwave power beams. A tether is a long cable usually made of thin strands of high-strength fibers or conducting wires. The tether can provide a mechanical connection between two space objects that enables the transfer of energy and momentum from one object to the other. The electrical current that is generated travels down the tethering lines to a transformer at the ground station, then is redirected to the power grid. Helium is the chemical element with atomic number 2 and an atomic weight of 4.002602, which is represented by the symbol He. It is a colorless, odorless, tasteless, non-toxic, inert monatomic gas that heads the noble gas group in the periodic table. Its boiling and melting points are the lowest among the elements and it exists only as a gas except in extreme conditions. The blades are relatively thin because this means they have a greater surface area to volume ratio and so are affected more by the wind. For a simple demonstration, think of the difference between fanning yourself with a flat piece of paper and a rolled up piece of paper. The flat piece causes a far greater movement of air and the same goes in reverse. Air movement is going to affect the flat piece much more than the roll, although the weight is the same. The blades are also curved to increase their efficiency. As the blades move they cause a shaft in the body of the wind turbine to start turning. This leads into a gearbox. Gears transmit rotational energy in a similar manner to the cogs in an old fashioned clock. The gears in the gearbox of a wind turbine end up spinning far faster than the blades were. Wind turbine blades turn at a speed of 10-50 revolutions per minute, and are equipped with regulators that shut the system down during hazardous weather to avoid having them spin out of control. Blade Specifications: Obviously, this is the one variable that engineers can control. Longer, slimmer and lighter turbine blades can increase energy production. In his detailed May 5, 2010 article, Wind power Engineering Editor Paul Dvorak stresses the importance of turbine blades being as light as possible, yet durable enough to withstand high winds without breaking. Current blades range from 130-300 feet (40-90 meters), but future prototypes may be as big as 435 feet (145 meters). There are two types of turbines. One is the vertical-axis type. It works like an egg beater. It works for small power uses: pumping water and grinding grain. This turbine cannot produce enough energy for electrical purposes. The second turbine is a horizontal axis, which has the capabilities of converting wind into electricity. This is the style used today on wind farms. Turbines will generally last for around 120,000 hours, or about 20-25 years. Since they have moving parts, they require maintenance and repair, at a cost of about 1 cent per killo watt hour produced, or 1-2% annually of the original cost of the turbine. The Honeywell turbine would measure 57 feet across and carry two one-megawatt turbines. In 34 MPH winds at 5,000 feet, the device would travel at 172 miles per hour and generate a megawatt of energy. The generator sits in the back of the device to add stability. This is done by the massive rotor blades, which form the visible part of a wind turbine. The wind turbine generator converts mechanical energy to electrical energy. Wind turbine generators are a bit unusual, compared to other generating units you ordinarily find attached to the electrical grid. One reason is that the generator has to work with a power source (the wind turbine rotor) which supplies very fluctuating mechanical power (torque). A generator situated 500-1000 feet above ground level would enjoy much more consistent strong wind - which is why the Magenn MARS system makes so much sense. It's a helium-filled rotating airship that spins in the wind on the end of a variable-length tether that also acts as a power transmitter, and it's expected to operate at more like 50% of its rated capacity. On large wind turbines (above 100-150 kW) the voltage (tension) generated by the turbine is usually 690 V three-phase alternating current (AC). The current is subsequently sent through a transformer next to the wind turbine (or inside the tower) to raise the voltage to somewhere between 10,000 and 30,000 volts, depending on the standard in the local electrical grid. Large manufacturers will supply both 50 Hz wind turbine models (for the electrical grids in most of the world) and 60 Hz models (for the electrical grid in America). Wind spins a turbine's blades, which, in turn, cause an attached generator to also spin. The wind blows through blades (made of fiberglass-reinforced polyester – this makes the blades lightweight and yet strong enough to withstand the force of the wind).The blades change the wind's energy into a rotational shaft energy (think of a standard fan).The shaft connects to a drive train with a gear box that uses the rotation of the blades to Spin the magnets in the generator to produce mechanical energy This mechanical energy is imparted to the shaft in the hub of the turbine and causes a great amount of torque to develop on the shaft. At the other end of the shaft, a gearbox transfers the energy to a secondary shaft. The step up gearing causes higher revolutions per minute (rpm) in the secondary shaft and consequently lower torque. A generator or alternator is mounted on the secondary shaft, and converts the mechanical energy originally imparted by the wind to the turbine. A protective cover, “nacelle”, houses the shaft, drive train and generator. The generator then converts that moving energy of the wind into electricity using electromagnetic induction, which involves using the opposite charges of a magnet to create an electric current. The generators are at each end of the rotor with a direct output power connection to the twin cables. Outboard of the generators at each end of the rotor are wind vane stabilizers in the form of conical wheels. The deviation in the trajectory of a spinning projectile caused by the Magnus force. The deviation is toward the direction of the spin and results from pressure differentials in the spinning projectile. The Magnus effect is greatest when the axis of spin is perpendicular to the direction of relative fluid velocity The Magnus effect, associated with the rotor rotation, also provides additional lift, which stabilises the rotor position causing it to pull up overhead, rather than drift downwind on its tether. Wind causes the blimp to rotate: That movement gets converted into electrical energy and is then transferred down the tether. The wind pushes the rotor blades, converting kinetic energy to rotary motion. This spins a low-speed shaft, which turns a gear at the lower end. The gear in turn drives a smaller gear on a high-speed shaft that runs through generator housing. A magnetic rotor on the high-speed shaft spins inside loops of copper wire that are wound around an iron core. This creates "electromagnetic induction" through the coils and generates an electric current. The current must be regulated for the strength of current desired (110 w in the US for household AC current). It is then fed into a grid or routed into a battery bank for later use. Part of what enables the MARS to stay vertical at high wind speeds is due to something called the Magnus effect. This refers to the lift created when a curved object spins while moving in a fluid medium like air. When the object spins, an area of high pressure forms beneath it and causes it to rise. Golf balls, when hit a certain way, and curveball pitches in baseball, have a back spin that causes them to lift in flight -- this is the Magnus effect. Since the effect increases as wind speed increases, the MARS is able to use it in combination with the lift from the helium to maintain a near vertical position and not lean in high winds. The wide range of speeds at which it can operate means that the MARS can deliver output much closer to its rated capacity than standard designs can. This is because although wind energy can theoretically generate significant amounts of electricity, most generators only produce a fraction of that because of inconsistent winds. Fewer limits on placement location - coast line placement is not necessary. Ability to install closer to the power grid Mobile Ideal for off grid applications or where power is not reliable. M.A.R.S is first tested on April 2008 successfully by Fred Ferguson .Thus MARS is the most efficient, cost-effective, eco-friendly, mobile, low maintenance way of generate electrical energy out of wind energy. Due to inadequate supply of power production many private sector have turned their vision towards thermal power plant. In 2015 there could be around 9 thermal power plant in Tuticorin to meet the energy need. Due to the introduction of MARS many private sectors have turned their attention towards it because of its advantages over other systems. It would be ideal for the country like India which having vast verities in geographical landmarks to implement such power stations as it could be installed where it could be. It is the best solution for the power-crises faced by whole world. So what happend since 2008? I tried to find some new information, but I'm just able to find information around 2008. So I guess this wasnt really a breakthrough innovation? But why?